One of my favouite dive locations out of the hundreds of dive sites found in and around Jervis Bay is Bowen Island. There are quite a few dives to be done along the eastern and northern sides of the island, including Pyramid Rock on the south-eastern corner. All along the eastern side of the island north from Pyramid Rock there are excellent dive sites. One of these I call Little Egypt. Little Egypt is located on the north-eastern corner of the island at GPS reading of 35º 06' 58" S and 150º 46' 16" E (using AUS66 as datum - see my GPS Page about what this means). 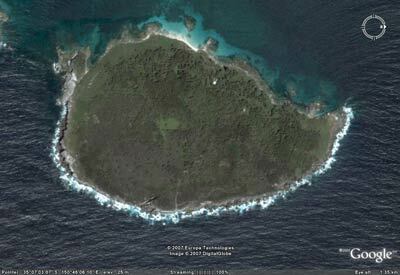 There are five pyramid like rocks located on the edge of the island, different sizes, hence the site's name. Run in on these rocks and anchor as soon as the reef appears on the depth sounder. The reef comes up from 34 metres to about five to ten metres right on the island's edge. For a dive at this location, I suggest swimming back to the reef's edge and in one of the two available directions. All along here there are huge boulders and some swim-throughs. After a while, come up shallower and head back towards the boat. More swim-thoughs can be found at this depth. When you get back at the anchor, try the shallows where there are even more caves and swim-thoughs. This is an excellent dive location, with the normal sponge and sea squirts as well as sea whips galore. Fishlife here includes eastern blue devilfish, sea dragons, six-spined and black reef leatherjackets. A very good dive for divers with a bit more experience.